(GREAT BARRINGTON, Mass.) 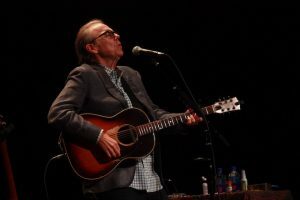 – From the first notes he plays and sings, John Hiatt makes you feel comfortable, because you know you are in the hands of a master and you can give it up to him for the next 90 minutes to two hours. 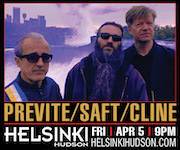 Hiatt embodies the Platonic (or Rogovoy-ian) triad of singer-songwriter perfection: the well-crafted songs; the technical command of his instrument; and the unique voice, and by that I mean both distinctive vocals and an identifiable personality that runs through everything he does. 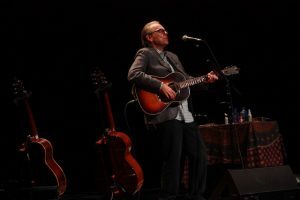 He put it all on display like the master he is at the Mahaiwe Performing Arts Center on Friday night, May 6. 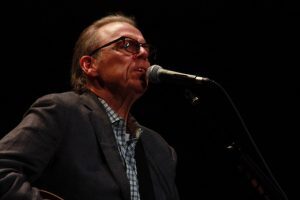 In conventional terms, you’d probably say that while Hiatt is a great songwriter – his songs are widely covered by other artists, and often they’ve become pop and country hits – he maybe isn’t a great singer or guitarist. 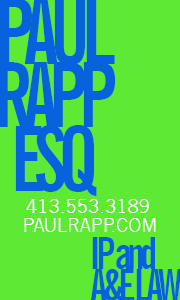 But that’s only a judgment rendered by taking his singing and playing out of the greater context, and, comparing him to virtuosos of voice or instrument. 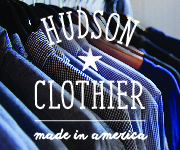 But with Hiatt, it’s the whole package that works together and makes the whole greater than the sum of the parts. Plus he has that extra special component, that element of personality, that makes him unique, and in his case, endearing or even adorable, such that there is hardly an evening to be spent in a concert hall with anyone else that is as enjoyable. 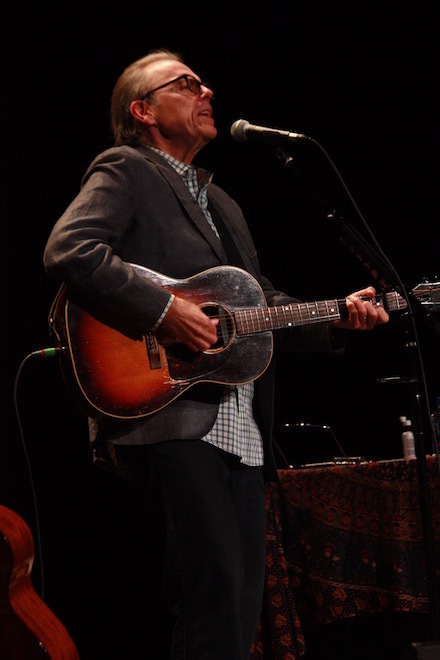 Others who come to mind are fellow masters like Lyle Lovett or Shawn Colvin, who know just what to say, just what to play, how much to give, how much to hold back, how much to let the audience laugh with them or even at them, while dazzling the crowd in every song with an apt word or phrase or lick or vocal turn. 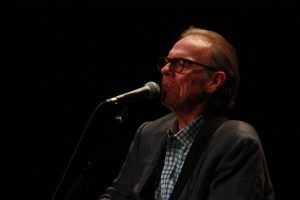 In Hiatt’s case, the voice is gluey and elastic at one point, and then smooth and soulful at another, like a fusion of Muddy Waters and Smokey Robinson. 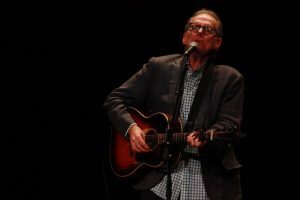 Indeed, one of his best loved tunes is called “Crossing Muddy Waters,” although those are an entirely different waters, and it’s more of an Anglo-Irish folk ballad. 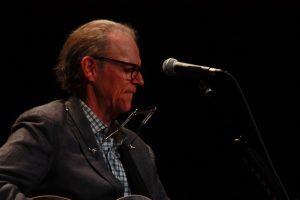 Hiatt gently poked fun at rock star excess in his fan favorite, “Perfectly Good Guitar,” and pleased the crowd with his achy ballad, “Cry Love.” His hit “Memphis in the Meantime” included a veritable encyclopedia of licks and musical styles – he even threw in a riff from the Beatles. 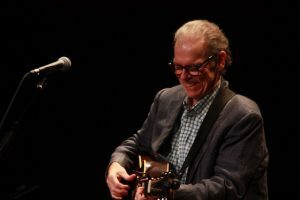 Hiatt draws on the entire range of music we sometimes now call Americana, but he’s been doing it for decades, and his is a unique fusion of country, folk, rock, blues, soul, pop and even a touch of jazz. 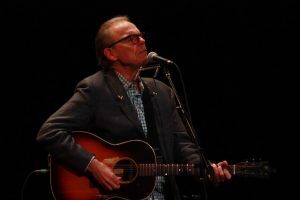 Nothing escapes his palette; nothing comes out quite like you’ve heard it before; it all adds up to John Hiatt music, which is truly an American treasure. 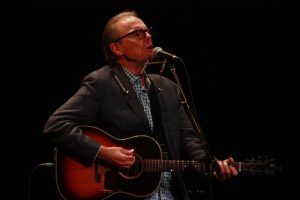 Put him on rock ‘n’ roll’s Mount Rushmore aside Bob Dylan, Neil Young, and Joni Mitchell – he can easily hold his own in that company.